"The Recon Marines of the 267th Marine Regiment was deployed in Argentina within a UNSC cordon, set up around the wreckage of the CCS-class battlecruiser "Chaste Ascendancy" following its crash-landing on Earth. Operation Chastity is their last mission in a forgotten part of the Human-Covenant War." 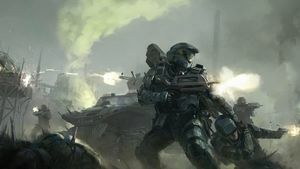 Operation Chastity was a planned fan-made feature film set in the Halo universe, centering on a platoon of Recon Marines of the 267th Marine Regiment. The film was being helmed by Peter Cooper, a British Halo fan and first-time film maker. Operation Chastity was a completely independent work, unaffiliated with 343 Industries, Bungie, or any other official party. The film opens in February 2553, four months after the Battle of Earth and one month before the official end of the war. Recon Marines belonging to the 267th Marine Regiment, led by Lieutenant Ashton, are sent to destroy the San Solano observatory, an abandoned base in Argentina behind enemy lines, as part of the preparation for the opening phase of Operation Chastity – a search-and-destroy operation to cleanse Argentina of the last pocket of Covenant resistance on Earth. While setting up demolitions, the regiment spots HEV pods being deployed nearby. Shortly after they are attacked by a swarm of Covenant Grunts, Brutes, and Banshees. The Marines hold off the attack long enough to escape and call for an airstrike by the frigate Hope Springs Eternal, but are decimated to barely half of a platoon. Ashton orders them to retreat to Command HQ and regroup with Bravo Company, but creates a rift when he orders them to leave the crippled Private Rivers behind. Corporal Foster stays with him as the 267th leaves the area. The Marines use SATCOM imaging to find their way, but Ashton grows frustrated when he sees portions of the map are being blacked out. He suspects it might be interference from the Office of Naval Intelligence, and orders a squad to check out the dark zone. There they see numerous dead Covenant, and glimpse their killer, a Spartan-II. Arriving at Command HQ, the Marines are dismayed to find that it too was attacked. They find only a handful of survivors, and they stay the night in the bombed out base to tend to their wounds. Securing a connection to command, Ashton receives orders for the 267th to head to Firebase Kilo, a UNSC stronghold. They leave the following morning to head to the base, passing through war-torn streets and encountering a few Covenant before making contact with Marines of the 29th Reserve Regiment, who they have mutual resentment for. After arriving at Kilo, the Marines unwind and rest, expecting to be sent home soon. Ashton is called to a classified meeting with Lt. Commander Thordarson, of ONI Section Three. He is informed that the Covenant that attacked San Solano were from the Chaste Ascendancy, a crashed CCS-class battlecruiser that was carrying numerous Covenant criminals who were put into service in exchange for freedom. At his urging, the Sangheili allied with humanity were convinced not to glass the crash site. As for the ODSTs, they were part of the 11th Division and most of their pods were destroyed. Claiming there may be a few survivors, Thordarson orders Ashton to rearm his men for one more mission before they can go home. Ashton reluctantly tells them the news but assigns a few trusted Marines (Winters, Ince, and Foster) to Thordarson’s command Pelican in case the Lt. Commander tries to pull something unusual. The 267th and 29th are deployed by Pelican to an abandoned control tower where the ODST survivors are claimed to be. However, they do not find any troopers but instead the Spartan, Maria-062, under orders by Thordarson to investigate the area. She tells him that the ODSTs managed to put a tracker on their target before the Covenant killed them. They return to the Pelicans with Maria, where Thordarson tells the Marines of their true mission: to acquire a Covenant cargo that he suspects is a weapon of mass destruction. The cargo has been tracked to the Las Armas munitions factory, where Chaste Ascendancy's crew has assembled. As an airstrike could risk setting off the device, the Marines are deployed to capture the package. As they reach the site, the Covenant shoot down their Pelicans and an enormous battle breaks out. Most of the Marines and Maria struggle to hold off the enemy from the crash site. Thordarson and Ashton’s select team are cut off from the others and proceed to the target through underground tunnels. The squad reaches the Las Armas factory, where they kill a few Grunts and find the weapon, which appears to be a Forerunner box that Thordarson orders them not to touch. However, before they can claim it, a Brute Chieftain and his Stalkers attack and capture the Marines. Managing to get a Warthog working, Maria and Ashton drive to the target in hopes of rescuing their men. The captured squad has been put in cages, and the Chieftain forces Thordarson to open the artifact. It turns out to contain a single Pod infector, and the Chieftain lets it infect Thordarson so as to begin a plague that will wipe out humanity – a final act of desperation, and a plan conceived by the Prophet of Truth to ensure victory for the Covenant. Just in time, the Spartan arrives, kills the Chieftain and the Flood combat form, and rescues the Marines. The squad regroups and they flee the area while Longswords bomb the remaining Covenant. During the retreat, however, they take further casualties, including Lt. Ashton. After the battle ends, Maria-062 leaves the group and disappears using active camouflage. The Marines return to Kilo Base, where they mourn their dead and assemble their belongings, ready to leave the battlefield for good. The last to go, Private Winters, gets in contact with his family in a refugee shelter before boarding a medical Pelican with the rest of his unit, finally able to return home after a long war. Lieutenant Dean Ashton: The commanding officer of the 267th Marine Regiment’s recon platoon. Though pragmatic about the war to the point of ruthlessness, Ashton harbors deep regret for the lives lost under his command. Private First Class Carl Winters: The recon platoon communications specialist. Winters has a wife and young children, and is constantly trying to get internet reception for his laptop, as his family was in Cleveland when the Covenant attacked it and he must know if they've survived. He eventually discovers they were rescued and are living in Stockholm. He keeps a photograph of them at all times, which at the end is too stained in blood to be cleaned. Corporal Ash Westwood: The sniper of the 267th. His family was killed during the Siege of Paris IV and since then he has been completely committed to his job. He has sympathy for Winters, though he does scold him when the private's attempts to contact his family risk compromising their location. Private Rob Savage: Westwood's spotter. He is not as collected as Westwood, and thinks the sniper doesn't consider him a partner. Though he thinks of Winters as a coward, Savage himself is frequently reluctant in combat. He is unable to drive a Warthog, but useful with the turret. He has a sister living on Ascension. Private Ada Legzdins: Legzdins is steely and unflappable, even when faced with incoming Banshees or Brutes about to tear her alive. The only thing to cause her fear is when Foster is in danger, who she is in a relationship with. Allegedly she bruised McCready when he tried to hit on her. She is fond of heavy metal. At Las Armas her arm is badly bitten by an Unggoy. Corporal Stephen Foster: An experienced squad commander of the 267th. He is in a relationship with Legzdins, and despises Lt. Ashton after he orders the regiment to leave Rivers for dead. Although he punches Ashton when the two unexpectedly meet again at Firebase Kilo, the lieutenant respects him enough to assign him to the select squad to "guard" Thordarson. During Las Armas he is struck down by a Brute Gravity Hammer, but survives. Private James Kearton: A machine gunner of the 267th. Kearton is too wounded to fight for most of the plot after a Banshee's plasma shot sears his chest. He is loyal to Ashton, and wishes he could participate in their classified mission. Private Chris McCready: A Marine of the 267th. During the observatory attack he's cornered by the Covenant and chooses to detonate the bunker with himself still inside. Sergeant Neil Sorvel: Caught literally with his pants down when the Covenant attack, he is mortally wounded by a Kig-Yar sniper. Sergeant Daniel Murphy: The leader of the platoon left after the regiment is attacked. He is sympathetic and calm. Petty Officer Marcia Bignot: The Navy corpsman with the group. She is slight in build and grumpy. She has a wife, and sympathies for the Insurrection. She is knocked unconscious during Las Armas when she charges at a Brute with a Brute Shot, but survives. Private Mark Rivers: One of the Marines applying C7 in the abandoned satellite observatory. He is crippled from the waist down during the observatory attack, and is left behind on Ashton's orders, though Foster manages to get him to Firebase Kilo alive. He remains unconscious and in hospital care afterward. Private Majid Bougherra: One of the few survivors of the Covenant's attack on Company HQ. He joins the regiment after they discover him alive. Bougherra is often unfazed and snarky in otherwise serious situations. He is of African descent, from Coral, and implied to be Muslim as he refuses to eat pork. He is killed during the assault on Las Armas. Corporal Clayton Ince: Another survivor of the HQ attack. He is a close friend of Ashton, and insists his decision about Rivers was right. He is defiant to the Brutes, yelling that humanity will wipe them out just like the aliens tried. During the Las Armas attack his eardrums are blown out and he is killed by a plasma round. Lieutenant Commander Thordarson: An ONI Section Three officer. He reassigns Bravo Company on his classified mission, then the 267th after they turn out to be all that is left of Bravo. During the Las Armas attack he is wounded by numerous spiker rounds and then infected by a Flood spore, which Spartan Maria kills. Major Tom Colliss: Thordarson's ODST liaison. A special ops veteran, he doesn't like being subordinate to the Lt. Commander. Petty Officer Maria-062: A Spartan-II under Thordarson's command. Despite claiming to have retired in October 2552, she is evidently back in service following the Covenant's attack on Earth. She is implied to have a family, and wields a battle rifle and Spartan Laser. At one point Maria is handed a data chip, which is said to contain an AI called Christen. Unnamed Jiralhanae Chieftain: The leader of the Covenant holdout forces. With their artifact he plans to use the Flood to wipe out humanity, knowing full well that the parasite will likely end up killing him and all his forces as well. Having heard that the Elites' claim that the Great Journey is false, he considers taking his enemies down with him as a worthy cause. Pvt. Winters was to be his "last meal". "This whole thing started when I got back from the United States. I'm busy writing a film treatment for someone when the idea crops up in my head - "How cool would it be to build a Warthog from Halo?" I start talking to engineers who agree to help make plans based on Land Rovers, and I share my project with a few people, who get a bit excitable. They then ask the question - "What are you going to use it for?" "Don't know. Just thought it would be really cool." "Why don't you make a movie with it or something?"" Operation Chastity was first announced by Peter Cooper on October 31, 2008. The announcement focused on the pre-production creation of a working M12 Warthog to be featured in the film. Cooper's initial plan had been only to assemble the Warthog, then was encouraged by friends to use it in some comedy shorts, leading to the idea to produce a feature-length film. The Warthog, subsequently completed, was made from an 1983 Land Rover Defender 110. Unlike all other depictions of the Warthog, it was "right-drive" instead of "left-drive", since the vehicle's steering wheel could not be moved to the opposite side. In subsequent announcements, Cooper listed the film's initial budget as "between £25,000 and £30,000 pending further cash injection". The film was described as "being crewed by passionate fans and film makers from all around the world, reaching from the production’s home of Britain as far as the USA and Singapore". Over the next several years, information on the project was released in the form of press releases, concept art and production stills on the film's website, Facebook page, and Youtube channel. UNSC Marines and Spartans would have been featured. VFX work was reportedly scheduled for depiction of plasma fire, Banshees and Scorpions. No explanation was ever given for what would have been used to depict Covenant infantry, though a tweet suggested they would have been modeled. A trailer was filmed but ultimately not completed. It was intended to serve as a “slice of life” teaser showing combat taking place around the Chaste Ascendency perimeter prior to the commencement of Operation Chastity. Filmed footage included columns of transport Warthogs, street battles in an abandoned town, and a massive battle in an Argentinian valley around the Chaste Ascendency crash site, with the battle filmed in the style of the Halo 3 announcement trailer. Locations for the teaser trailer film shoot included RAF Uxbridge and Dunstable Downs in the United Kingdom, and actors in the teaser included Joerg Stadler, Arkie Reece, Anthony Topham, Al Gregg, Josh Dyer, Alexandra Metaxa and Vin Hawke. Illustrator Barry Renshaw was hired to create storyboards for the CG section of the teaser, centered around a UNSC frigate battling numerous Banshees with a squadron of Hornets. On April 11, 2011 a behind-the-scenes video of the production was posted on the Machinima Youtube channel. The video is footage of a shoot at a single location, featuring several Marines and the functioning, turret-less Warthog. Actor Al Matthews was considered for a small role in the film as a callback to Sergeant Avery Johnson, who was in turn inspired by Matthews’ portrayal of Sergeant Apone in Aliens. However, his role was ultimately cut from the script in later drafts. A proposed ending to the story would have seen Ashton shot off the Warthog during the escape but surviving within Maria-062’s bubble shield during the UNSC air strike. All of the characters' names – with the exception of Maria and her AI, Christen – were inspired by or related to players and personnel of Crewe Alexandra Football Club, Cooper’s favorite soccer team. Maria is the only canon character in Chastity's cast. The unit’s backstory was that they missed out on the Fall of Reach as they were in the midst of a refit along with their frigate, the UNSC Hope Springs Eternal. The ship was still dry-docked in the Misriah shipyards when Mars fell to the Covenant. Both the frigate and the regiment took part in the Battle of Earth and the combat that took place in Voi and New Mombasa after the Covenant invasion, before eventually being posted to the Chaste Ascendency containment zone in Argentina. The unit patch for the 267th Marine Regiment and the Hope Springs Eternal incorporated the Eridanus constellation, with a larger star used for Epsilon Eridani – the system that was home to the planet Reach. After much build-up, news about the project gradually petered out. The last known Twitter post on the film's feed was posted in February 2012. The film's website, Facebook page, and Twitter feed were eventually taken down, and Chastity's crew has declined to comment on the film's cancellation, Cooper saying he was barred from doing so or from rebooting the project. Chastity's Warthog was put for sale for £12,500 or $20,000. It was eventually bought by Rooster Teeth, who featured it on a Red vs. Blue-Immersion crossover episode testing real life vehicle flipping and then exploded it. The Warthog made for the film. Another shot of the film's Warthog. Animation of the dogfight storyboards. Archived homepage of Operation Chastity. Archived Official Xbox Magazine feature. Defunct Facebook page of Operation Chastity. Defunct YouTube channel for Operation Chastity. Concept art gallery by Kai Lim and Adam Burn. ↑ Twitter: RIP my faithful steed.